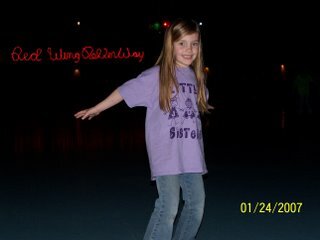 Here is a record of a first for Mackenzie -first time ever on skates of any kind. We went with most of the girls in her elementary school. I can’t tell you how funny it was to see our group of 10 first graders, all for the first time on skates. 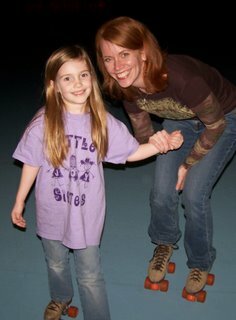 As much exercise as my legs got, I think my abs got the best workout from laughing so hard at all these little girls insisting on skating themselves. Mackenzie started out holding my hand or the rail but after about 10 minutes she took off on her own. Well "took off" is a bit of an exaggeration, it was more like she teetered off. She fell quite a bit but only shed tears once. She wanted to take a break after that, but by the time we skated over to the exit, she was ready to go again. She even managed a pretty decent hokey pokey. I was a bit nervous about putting skates on since I couldn't remember the last time I roller skated. I'm guessing I was probably about 11. Needless to say, I was not the essence of grace but I made it without falling. I was just so grateful to be with Mackenzie. I am enjoying every minute of this time when she still thinks it's fantastic to have me tag along on her outings. Thanks Amy, I appreciate that.